Properties in Rhodes average 4.5 out of 5 stars. Beachfront Luxury Apartment With Private Access To The Beach. Property 6: Beachfront Luxury Apartment With Private Access To The Beach. Cosy apartment for two opposite Kritika beach, just outside of Rhodes town. Property 16: Cosy apartment for two opposite Kritika beach, just outside of Rhodes town. Haraki Dream View, two steps from the sea. Α Family friendly resort. Property 22: Haraki Dream View, two steps from the sea. Α Family friendly resort. Brand New!!! Lindos shore Superior Studio just above Lindos main beach !!! Property 37: Brand New!!! Lindos shore Superior Studio just above Lindos main beach !!! Spacious and comfortable apartment. Clean quiet with a garden. It has view to the city of rhodes and the sea.I really want to visit again. The apartment is delightful and very nicely renovated. 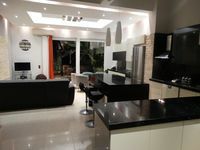 Very clean and with a personal touch from the owner visible on the furniture and decors. The spacious courtyard is also a plus for the warm summer evenings. The host is also delightful and very available. One small thing we noticed is the second wooden floor was a bit noisy to hear from below. But the noise was sporadic, it&rsquo;s probably a verandas upsatir and not constantly used. Overall we had a great stay and I would recommend anyone to stay here.